Walruses in Alaska have started to gather in huge numbers on Alaska’s shorelines the past few years because their sea ice that they usually rest on and hunt from has been disappearing from climate change. This is alarming scientists because walruses would normally gather in smaller groups of less than 100 individuals on sea ice, but now they are gathering on land in groups up to the tens of thousands! This has some dire consequences for walruses: they can spread disease much easier, run out of food nearby, kill each other in stampedes (an adult male walrus can be up to 1.5 tons! ), and predators such as polar bears and brown bears are nearby. 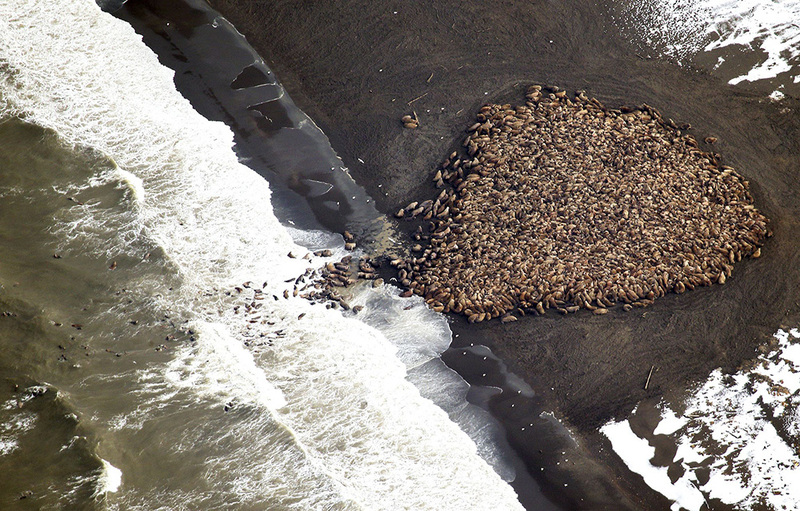 Planes flying overhead can freak the walruses out and cause them to stampede, so the only thing humans can do to improve their situation is to reroute planes around their huge groups on shore.